ohhh blood was everywhere I checked Harvey he was fine then checked Nix....her paw was dripping with blood, she had bee running round the garden for ages barking at the hedge cutter man ast he back of the house. 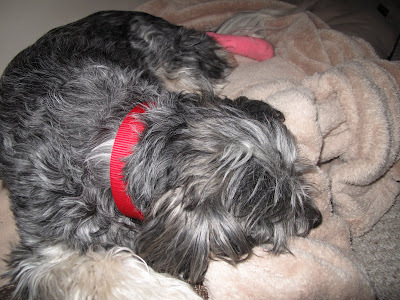 I wisked her off to the vet like a mad woman she had to be shaved have the cut stapled, antibiotic injection, anti inflamitry (sorry cant spell) injection and dressed but he kindly gave her a fabby girls pink bandage..
She is feeling very very sorry for herself but she will be fine. Also while she was there she had the very vary large lumps drained a little and the vet tells me there just 'fatty lumps' fantastic ve ben sooo worried.